In MIG welding, there are four different basic modes to transfer weld metal (filler material) across the arc to the base material. These transfer modes are Short Circuit, Globular, Spray Arc and Pulsed MIG. When MIG welding, a continuous solid wire electrode is fed through a welding gun along with shielding gas, normally an Argon mix. The materials are joined together when the consumable solid wire connects with a current which creates an “arc" between the weld metal and the base material. The different transfer methods are how the weld metal from the consumable electrode is transferred to the base material over the arc. 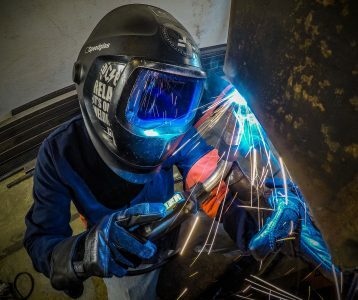 There are no settings on a MIG welder to choose a transfer method - each method is achieved through voltage / amperage (wire feed speed) setting adjustments and the type of shielding gas mixture used. The Pulse transfer is the exception, where you need a special MIG power source for this method, as well as the proper wire feeder along with a high argon content shielding gas mixture. Short circuit is the coldest form of MIG welding and uses low voltage. In the Short Circuit transfer method, the consumable electrode wire arcs and touches the base material and shorts. This creates a small, quickly solidifying, weld metal puddle that drips into the weld joint fusing the materials together sometimes referred to as “fast freezing.” Short Circuit method is great for thinner materials but you risk “cold lapping” on thicker materials. This method also creates an increased amount of spatter. Globular transfer method is very similar to the short circuit transfer method, which the consumable electrode wire arcs and touches the base material and shorts. The difference comes in how long the consumable electrode melts. In Globular method, the wire is heated longer and creates a large volume of weld metal that drips into the weld joint. It uses a high heat input and also risks less fusion because of large amounts of spatter disrupting the weld puddle. You are limited to flat and horizontal fillet welds with this method. In the Spray Arc transfer method, small droplets of molten metal from the consumable electrode are sprayed into the weld joint. This is a pure CV (constant-voltage) process that sends a constant stream of weld metal across the arc to the base material. This method uses a high heat input and you risk burn-through on thinner materials and only allows for limited to flat and horizontal weld positions. Pulsed MIG transfer method is a modified form of the Spray Arc method, taking the best parts of all the transfer methods and minimizing their disadvantages. 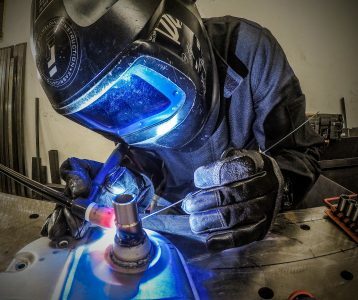 Pulse MIG welding does require a special power source, which pulses the voltage many times per second. This allows one droplet of molten metal to form at the end of the consumable wire and the current, and then pushes the droplet across the arc into the weld puddle. A droplet is formed every pulse. Since the voltage drops on every pulse, this creates a longer cooling off period and may reduce the HAZ from the weld. 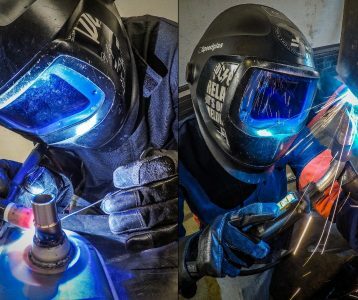 Pulse MIG transfer minimizes spatter or the risk of cold lapping, and weld positioning is not as limited as the Globular and Spray methods. Typical weld defects found in MIG welding are lack of fusion, burn thr... View Story Created with Sketch.